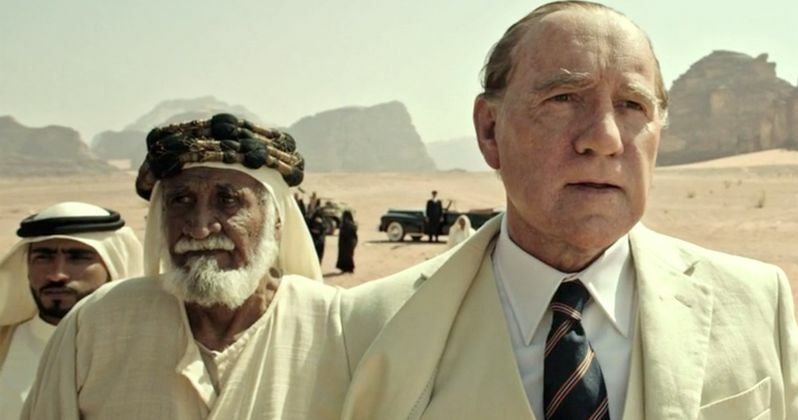 With just over a month left until All the Money in the World is set to arrive in theaters on December 22, the cast and crew have unanimously agreed to remove Kevin Spacey from their finished film. The production has recast Christopher Plummer in the role of J. Paul Getty, with reshoots to start immediately. Despite this shocking move, in the wake of widespread sexual misconduct allegations against Kevin Spacey, director Ridley Scott still plans on keeping the December 22 release date intact for this biopic. Mark Wahlberg and Michelle Williams are coming back for the reshoots, after director Ridley Scott, along with producers Dan Friedkin and Bradley Thomas from Imperative Entertainment, and Sony Pictures decided to remove all of Kevin Spacey's scenes from the film. The move also comes just days after the studio and filmmakers decided to pull All the Money in the World from AFI Fest, where it was scheduled to be the Closing Night gala film on Thursday, November 16. Both Ridley Scott and Dan Friedkin in particular were reportedly "incensed" that this scandal could hurt the film, which the director reportedly "dropped everything to direct." Since so many had worked so hard on the film, the director and producer didn't want to see it released in the wake of a scandal, so the decision was made to remove Kevin Spacey completely from the film. Kevin Spacey reportedly worked between eight and 10 days on the film, which director Ridley Scott boarded this March and got production started by May, to get the film ready for its Oscar-friendly release December 22. The story centers on Michelle Williams' Gail Harris, the mother of John Paul Getty III, who was kidnapped in Italy as a teenager in the 1970s. Mark Wahlberg plays Fletcher Chase, the advisor to J. Paul Getty, who at the time was the richest man in the world, and still refused to pay the ransom to release his grandson, even after his abductors cut off his ear and sent it to the family. Along with reshooting all of Kevin Spacey's scenes, all of the marketing material will have to be re-cut with new scenes featuring Christopher Plummer as the oil magnate billionaire J. Paul Getty. While reshoots of this nature, so close to a film's release is likely unprecedented, it's actually the second time that the cast and filmmakers have chose to make a supremely bold statement in the light of a scandal. Last month, after the Harvey Weinstein scandal unfolded, Wind River writer-director Taylor Sheridan, along with stars Jeremy Renner and Elizabeth Olsen and producers Basil Iwaynk and Matthew George, were able to cut all ties with its distributor, The Weinstein Company. All of the company's logos have been scrubbed from the film and its promotional and marketing materials, along with all home video releases, including Netflix streaming release and, most importantly, from awards season screeners. Instead of The Weinstein Company financing its Oscar campaign, which was a specialty of Harvey Weinstein's for decades, an entity known as Acacia Entertainment, backed by the Tunica-Biloxi Indian tribes which put up the $10 million budget for the movie, will finance the Oscar campaign. All the Money In the World also stars Charlie Plummer as the kidnapped John Paul Getty III, along with Timothy Hutton, Olivia Grant, Andrew Buchan, Romain Duris and Charlotte Beckett. Ridley Scott directs from a script by David Scarpa, based on the book of the same name by John Pearson. The film will hit theaters December 22, going up against Universal's Pitch Perfect 3, Paramount's Downsizing and . Kevin Spacey is just the latest to be accused of sexual misconduct, with others including Dustin Hoffman, Steven Seagal, directors James Toback and Brett Ratner and many more. Deadline broke the news on this unprecedented move by the All The Money in the World filmmakers earlier today.